Triple your gear range compared to a standard triple crankset with the Pinion C1.9XR. 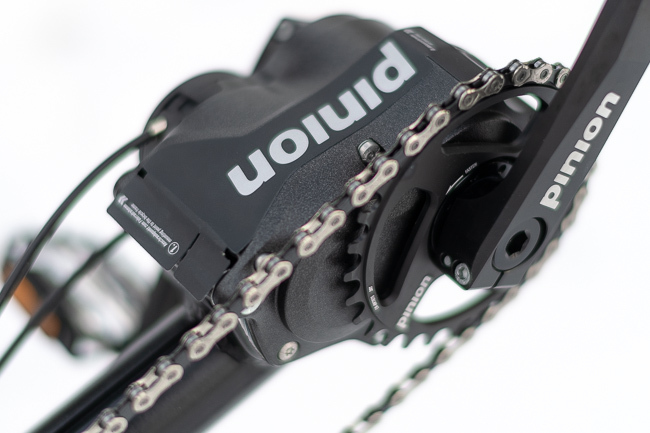 This wide range crank combines perfectly with rear derailleur gearing for incredible gearing. The increased gear range of the P1.9XR is ideal for the long distance rider or anyone that deals with rapid changes of topography. The maintenance-free and permanently encapsulated drive with the wide range of gears allows lightning-fast and always reliable shifting. It guarantees perfect flow on uphill and downhill stretches. The wide spacing of gears combines perfectly with cassette gearing in the rear so that you'll always have usable gearing. Now you can add a 9, 12, or 18 speed Pinion Drive to your Catrike. We use the Catrike boom extrusion tubing with their "peace sign" strength webbing and alignment channel. Powder coated black, or can be painted to match if purchased with trike with UTCustom colors. Pinion Drive not included. Precision CNC machined from billet aluminum, these cranks deliver as much power as you can put out. The 165mm are the standard size but several other lengths are available. This one twist-style shifter gets you the full 568% gear range that the C1.9CX Pinion gearbox offers.